Historically, in our time and age, Prince Siddhartha attained enlightenment under the bodhi tree in Bodhgaya over 2500 years ago, and then became known far and wide as the Buddha, the Awakened One. According to buddhist cosmology, he was the fourth historic Buddha of this fortunate eon, in which a thousand Buddhas are to appear. Prince Siddhartha’s achievement of enlightenment, the realization, or wisdom of enlightenment itself, is called the Dharmakaya, the body of truth. When he expresses that realization through subtle symbols, his realization is called the Sambhogakaya, the body of enjoyment. When such realization manifests in a more accessible or physical form for all sentient beings, as the historical Shakyamuni Buddha for instance, it is called the Nirmanakaya, the body of manifestation. 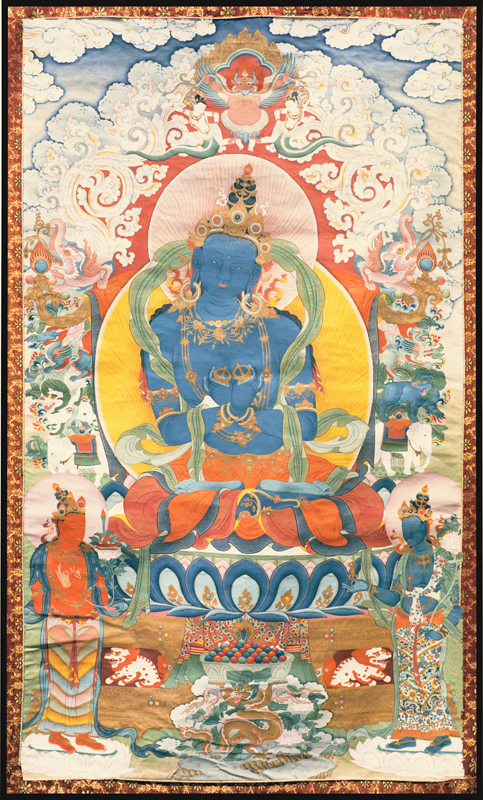 The Dharmakaya, synonymous with Vajradhara Buddha, is the source of all the manifestations of enlightenment. As such, the Buddha has often manifested in the shape of Vajradhara to many early buddhist masters. For instance Tilopa and Niguma have had visionary experiences of Vajradhara, in the course of which they received crucial instructions. 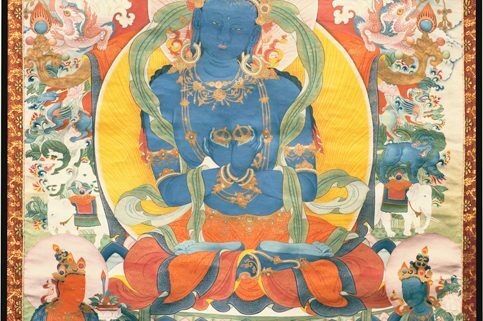 Thus, Vajradhara is often counted as the originator of the Kagyüpa and the Shangpa as well as many of the Sarma Schools, or schools of the later dissemination of the buddhist teachings in Tibet. The term Vajradhara is also used as an honorific title for great Vajrayana teachers.